To win over Afghans, China will need to see their country as more than just a security buffer. Afghanistan’s new president, Ashraf Ghani recently made his first foreign trip to China. During his visit, Ghani signed several economic and security agreements with the Chinese government and held discussions with President Xi Jinping, Prime Minister Li Kiqiang, and other Chinese officials. 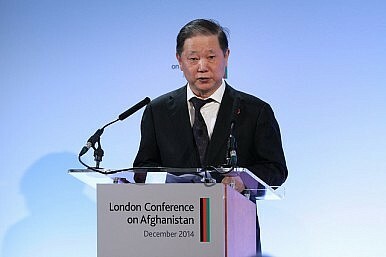 China pledged to provide Afghanistan with $327 million in foreign aid by 2017. China is already assisting the Afghan border police and has provided an estimated $400 million to the Afghan government over the past decade and a half. How good a partner for Afghanistan is China? History shows that Afghans have a tendency to either reject foreign interest and occupation completely, or become over-excited at the prospect of foreign economic and military assistance. But as quickly as expectations rise, they soon collide with Afghanistan’s geopolitical and economic complexities. The subsequent disappointment only encourages resistance to foreign occupation and even legitimate interests in the country. In recent decades, Afghans thought that first the Russians and then the Americans would bring peace and prosperity, but those hopes were soon dashed. As for China and its place within the Afghan political and public landscape – there are two views. The Afghan political and business elite tend to be Sinophiles, whereas the Afghan public are much more cautious and even Sinophobic. Among the Afghan elites, government officials, business community, and the Afghan oligarchs there is growing hope that China could be an alternative to the United States, even though the political, economic and military commitment that Beijing has made over the past decade or so has been questionable, and pales in comparison to the economic aid and military support provided by the U.S. and its allies. In contrast, the Afghan public look on the Chinese commitment to Afghanistan with skepticism and indifference, a reflection of the enormous cultural, religious and even political differences. The crackdown on Muslim Uighurs in China’s Xinjiang province has not helped in this regard. China has yet to prove itself a reliable economic and political partner for Afghanistan. China’s growing interest in Afghanistan is often viewed not in an economic context, but from a geopolitical and security standpoint. But Chinese tolerance of non-Uighur terrorist groups and networks on Pakistani soil raises many questions. With increasingly frequent attacks in Xinjiang province and several cross-border infiltrations, China has dispatched several high-level military and security officials to Afghanistan to discuss border security. Former Afghan President Hamid Karzai revealed in a recent interview with a local TV channel that Afghanistan has made fundamental contributions to the security of China. He did not elaborate, but this does suggest growing security cooperation between the two countries. Another goal of the Chinese visits to Afghanistan is expanding intelligence cooperation between the Afghan National Directorate of Security (NDS) and China’s own intelligence service, which has a strong presence across Central Asia. This is a good sign, but China needs to tackle not only Xinjiang terrorism but the global network of jihadists, many of whom operate out of Pakistan. China sees its growing security and economic presence in Afghanistan as a complement to its security presence across Central and South Asia. It realizes that Afghanistan is the missing link in its geopolitical and security presence in the region. While Chinese officials may well view Afghanistan more as a security and geopolitical risk than as a serious economic and trade partner, Afghans see China as a potential investor and economic partner. China’s total aid contribution to Afghanistan stands at $400 million dollars, and it has pledged another $327 million in grants through to 2017. This is a fraction of even the more modest European contributions, let alone the billions in economic aid and military assistance provided by the United States. China was in fact supposed to invest around $3 billion dollars in developing Afghanistan’s biggest copper mine, but following volatility in the global commodities market it has stopped work and is now calling for a negotiation of the copper contract. China National Petroleum Corporation meanwhile has failed to build the refineries and transportation networks it promised for its Amu Darya oil field investment. The cultural and civilizational differences between China and Afghanistan – indeed between China and much of Central Asia – are enormous. China’s atheism is just one of the many cultural and religious apprehensions that could prove a major bottleneck for its economic and security presence in Afghanistan. In fact, China has a lot of work to do to expand its currently very limited cultural influence across Central and South Asia. For now, China is enjoying positive coverage in the Afghanistan media, but failed projects and a sustained crackdown on Uighurs could end that, with negative consequences for Sino-Afghan relations. Sino-Afghan cooperation is in the best economic and security interests of both countries, but it will require a comprehensive framework and serious political will. China should stop viewing Afghanistan as a security buffer and geopolitical pawn within its larger regional interests, and instead look upon it as a true economic and investment partner. Afghanistan could support Chinese economic, trade, transit and security interests in Central and South Asia. That approach might just reconcile the Sinophilia of Afghan elites with the Sinophobia of the Afghan public, and enable a true partnership. Tamim Asey is a fellow at Asia Society and a Fulbright scholar at Columbia University pursuing a degree in Economic Policy management. He was a former Government of Afghanistan official and taught at the American University of Afghanistan (AUAF). A larger regional view helps shed light on China’s increasing activities in Afghanistan.